Hello, how’s things?! Hope all the UK bods have been able to enjoy this nice dry weather we are having right now. Long may it reign (please note spelling of reign!!)! This time the cuties are lucky to have 2 wonderful sponsors. 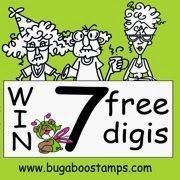 and one lucky winner will win 7 digis from their amazing range. Wow! 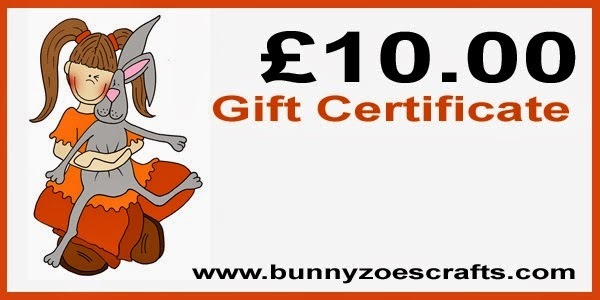 where one lucky sausage will win £10 to spend in their fabby online store. Double wow! Now if that’s not a massive incentive to join in I don’t know what is! So, being on the ball this year I have already made all my Mother’s Day cards! (Get me!) Therefore I had a chance to do one JFF. Which is a good job as the Bugaboo image I chose to use, called Girl and Flowers available here, is quite funky and my amazing mother may be many gloriously wonderful things, but funky isn’t one of them! To fully embrace the funky theme I plumped for a non-trad hair colour! And as purple is my fav colour that was the way I went using my Promarkers on super smooth card. Pop over to the Cutie Pies blog to see the inspirational makes created by my teamies and join in with our fab challenge. But please, please, please make it cute. The awwwwww-factor is definitely a requirement. Cute, cute card! Love the way you framed this adorable little gal & lavender is one of my favorite colors too! Thanks for joining us this week at QKR Stampede! OMG! Jane, this is so gorgeous hun, love the super cute image and scrummy design. Very sweet and adorable colours you have used on your card. Thanks for playing along with our butterfly challenge at PFP. A new fun challenge is up now. Beautiful card. Thanks for joining us this week for "Anything Goes." Good Luck. Hi Jane - this is a delectable dollop of deliciousness! Not sure about my alliteration, but this is a gorgeous card. Love the colour scheme and your pretty embellishments. Thanks for joining us at Incy Wincy Designs this week. Hi Jane, still think this is one stunning card! Fabulous colouring and colour choices. Fabulous and fun Jane. Love the funky colour and your stunning design detail. What a beautiful card. Thanks for taking part in the Cupboard Trilogy Challenge. A gorgeous card - I love the image and layout - and your colouring is perfect! Thanks for sharing with us at Paper Nest Dolls this time - hope to see you here again soon!